The Museum of Science strives to be a leader in using science to understand and consider the consequences of human actions on the Earth's ability to sustain and nurture life, and to use that understanding to guide our endeavors. We recognize that climate change and environmental sustainability are among the greatest challenges facing humanity today. Embracing our role as an educational and social institution, the Museum is addressing these issues head on by mounting exhibits and developing other educational resources, convening discussions, engaging experts, and taking significant steps to reduce its own environmental footprint. This includes improving building design and operations; energy and water conservation; incorporation of renewable energy; use of locally-sourced and environmentally friendly food and healthier food options; and expanding Reduce, Reuse, Recycle and Compost activities at the Museum. In 2000, the Museum began to focus on technology and engineering, a direction that led us to encourage our visitors to explore the impact of technology on their lives, our society, and our planet. It was only sensible to apply the critical thinking skills we help develop in our visitors to our own daily work. That process continues today. At first, the "greening" the Museum was done by individual staff members. At first we began recycling paper and then batteries. Our facilities department, of course, was working hard to reduce our energy consumption and costs. In 2004, the Museum formed a "Green Building Committee" of Trustees, Overseers, and advisors. One of this group's early contributions was a set of suggestions for the design of the Museum's Gordon Wing that led to a 38% reduction in the modeled energy consumption of that space compared to the original plans. The committee was challenged by a central question: Given that the Museum has its primary impact through its exhibits and programs, how much priority should it place on reducing its environmental impact – as opposed to investing in education? Exploration of this question led to the creation of the Museum's Sustainability Statement and the establishment of today’s "Environmental Sustainability Committee" with a charter to explore and make recommendations pertinent to the Museum’s goals and efforts regarding education, facilities and operations, convening of the community, marketing, organization development, and fund-raising. Today, environmental sustainability is habitually included in day-to-day thinking throughout the Museum. The sections below outline how sustainability has factored into our educational offerings and our facilities and operations. One of the Museum’s oldest exhibits, New England Habitants was refurbished in 2010. Using sustainable materials and replacing all lighting with LEDs gives it a fresh, inviting look and saves considerable energy. The Museum continues to expand our efforts in promoting conservation and renewable energy technologies by developing new exhibition components that will help visitors more clearly understand the global energy picture. We share our decisions and their subsequent results to foster an informed active citizenship. The Museum develops exhibits and programs and produces events about the interaction between the natural and human-made worlds to help visitors more clearly understand and think critically about sustainability-related issues. There aren't currently any upcoming events or exhibits relating to environmental sustainability. Check back soon! Discover the real energy sappers and savers in the home, and explore ways that you can make a difference. Learn about sunlight, wind, moving water, and other self-replenishing sources that generate energy with fewer negative side effects. 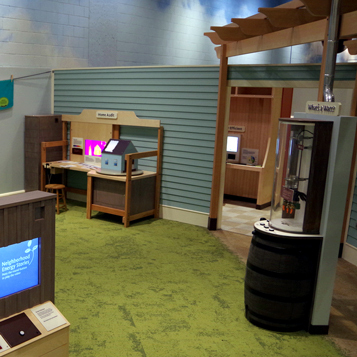 Learn how turbines transform wind into green energy, and track the Museum's Wind Lab energy production. 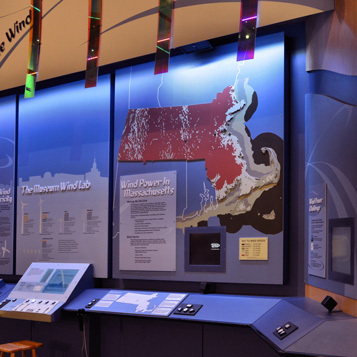 The Museum educates visitors about climate systems and climate change, renewable energy, conservation, and sustainability in general through its exhibits and programs. We practice the same critical thinking skills in the way we run the Museum. The Museum continues to identify and install improvement measures throughout the Museum facility, encompassing HVAC, lighting, boiler controls, and building envelope improvements. In 2009 and 2010, the Museum executed a performance improvement project to substantially reduce its energy performance; the study and subsequent project represented more than $3 million of investment. The Gordon Wing was constructed 2005-2006 with sustainability a high priority. South-facing full-wall windows have user-controlled sun shades. As a result of these measures, the Museum has reduced its use of natural gas, electricity, and water over time. The first graph below indicates the Museum’s combined electricity and natural gas consumption over time compared to the baseline and the targets established in our performance improvement project. The next two graphs break out natural gas and electricity consumption. The final one indicates water use. Using low or no VOC furniture and carpeting. Carpet tiles allow for more efficient repairs. Large south-facing windows provide natural light; staff can control glare and solar radiation with manually adjusted solar shades. HHL makes extensive use of sustainable bamboo for exhibit elements. The Hall of Human life, opened in 2013, incorporates sustainable building materials, green furnishings, natural and LED lighting. As part of the process of renovating the lobby, in 2014 the Museum replaced the four-story-high single-pane glass curtain wall facing the river with an insulated and electronically controlled glazing system. The new Sage Glass System is electro-chromatically tinted and connected to solar sensors that control the sunlight coming into the lobby, reducing solar glare and helping the Museum conserve energy. The system controls sunlight to optimize daylight, outdoor views, and comfort while preventing glare, fading, and overheating. 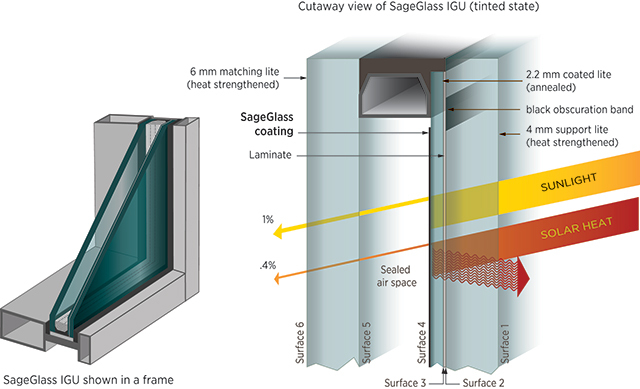 By letting sunlight in on cool days and blocking it on hot days, SageGlass dramatically reduces energy demand. The installation preserves the iconic views of the Charles River by eliminating the need for shades, blinds and louvers. The Museum strives to reduce our negative impact on the systems that are necessary for life, and seek opportunities to regenerate and enhance those systems. The results of these measures over time are presented below. Note that the large increases in some items in 2013 are due to a massive clean out rather than any operational change. In addition, the Museum complies with Massachusetts waste bans that restrict the disposal, transfer for disposal, and contracting for disposal of certain hazardous and recyclable items at solid waste facilities in Massachusetts. As part of its Green Initiative, the Museum investigated several options for adding renewable energy to our energy portfolio. In 2009, we installed 15.6 kW of rooftop small-scale wind turbines, and in 2010, 29.26 kW of solar photovoltaic (PV) panels. These turbines and solar panels convert renewable energy into clean electricity we use on site. 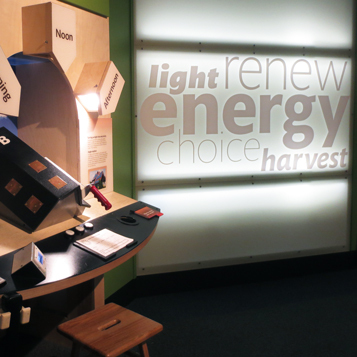 Since June 2011, the Museum of Science has drawn 100% of its electricity from green energy. Renewable Energy Certificates (RECs) from wind energy facilities across the U.S. match all of the Museum's electricity usage. The RECs support renewable energy generation and a commitment to operate in an environmentally responsible way. Since April 2010, photovoltaic panels on the Museum roof have been generating electricity and feeding it back to the Museum’s electrical power grid. This south-facing roof is not visible to most visitors, but is a good site for solar panels. The Museum’s popular Lightning shows create peaks of high electrical energy use in the Theater of Electricity; Over time the energy produced by our solar panels balances much of that electricity consumption. In 2009, the Museum of Science installed a rooftop wind turbine lab with five different types of small-scale turbines, a visible expression of sustainable energy at the Museum. The Museum's Wind Turbine Lab has experienced no issues with noise, vibration, ice throw, flickering shadows, bats, or other environmental problems, and just two bird strikes in more than five years. The Museum’s neighbors have commented that they enjoy seeing them in action, too. The Lab provides data for the Catching the Wind exhibit, where visitors learn about our wind turbines and energy technology. The Lab is also an independent, real-world test facility for these small-scale wind turbines in an urban environment, providing solid data and project experience for professionals, universities, government, and consumers. As such, it is not scaled to power a significant fraction of the Museum's electrical load; however, the turbines are grid-connected and the Museum does use their energy. The interdependence between humans and nature will be a central idea for a near-term Museum renovation, the Yawkey Gallery on the Charles River. Visitors will begin to understand the role of humanity in the dynamic global biosphere, and the great opportunity society faces to both critically understand and profoundly affect the Earth’s environment. The Museum’s core message of the interdependency of the natural and engineered worlds will be exemplified in the Yawkey Gallery on the Charles River, which will be located at the heart of the Museum, adjacent to the lobby. Humans have been living in and reshaping the Charles River watershed for over 5,000 years. In turn, the environment has shaped our culture and lives. The Gallery will explore how nature and technology are intertwined in our region. The challenges and solutions inherent in land use, dam building, species and habitat preservation, recreation, and wastewater disposal all illustrate the intimate relationship between humanity’s activity and the environment. In addition, visitors will be invited to observe the river and learn about its past, current, and potential future health through narrative histories, immersive media experiences, and access to real-time data sets. This section includes Museum-based resources and a selection of external links on environmental sustainability, climate change, and energy. With the importance of technological literacy and the need for trained scientists and engineers, the Museum of Science launched the National Center for Technological Literacy (NCTL) in 2004 to enhance knowledge of engineering and technology for people of all ages and to inspire the next generation of engineers, inventors, and scientists. The NCTL has developed elementary, middle and high school curricula currently used by over 5 million students nationally. Here are some examples that focus on sustainable engineering challenges. A component of the Engineering is Elementary (Grades 1-5, in-class) curriculum: The water you drink is clean and safe thanks to the environmental engineers who design and manage our water supply and water treatment systems. In this unit, the storybook Saving Salila’s Turtle introduces students to the problem of water pollution — and to some solutions. 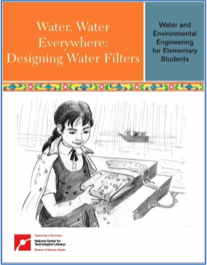 Students will investigate the properties of filter materials, apply their knowledge of water, and think like environmental engineers as they plan, construct, test and improve their own water filters. 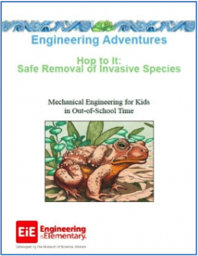 A component of the Engineering Adventures (Grades 3-5, Afterschool) curriculum: Oh no! India and Jacob accidentally brought a cane toad from Australia to New Zealand. Cane toads are pests. They’re an invasive species that hurts native species in Australia — and they could do the same in New Zealand. Kids will help India and Jacob engineer a humane trap to catch the toad. 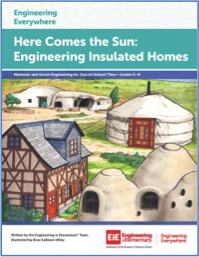 A component of the Engineering Everywhere (Grades 6-8, Afterschool) curriculum: Keeping homes at a comfortable temperature takes a lot of energy. Use your green engineering skills to insulate a model home. ScienceToGo.org is an NSF-funded collaboration led by UMass Lowell that includes the MBTA, UMass Boston, Hofstra University, the National Science Foundation and the Museum of Science. We are exploring new ways to share science with the public, specifically educational signage on the T coupled with a website and online social media. Our goals are to interest people in climate change, represent clearly and accurately what science has revealed, help us all think for ourselves, and explore science education outside of the classroom. We need energy for our everyday lives — to power our buildings and personal devices, to transport goods, to travel. Yet, the energy sources we've come to rely upon, like oil, gas, and coal, will eventually run out. Our planet enjoys resources that replenish constantly, including sunlight, wind, moving water, and geothermal heat. With our energy needs apparent, empower yourself with knowledge about these renewable sources and be inspired to find new ways to solve our local and global energy needs. NOAA is a primary provider of climate science, data, tools, and information used by stakeholders and citizens in decision-making contexts. These resources are supported by NOAA’s strong foundation in science — including global climate observation and monitoring networks; world-renowned scientists; and state-of-the-art climate models. The EIA collects, analyzes, and disseminates independent and impartial energy information to promote sound policymaking, efficient markets, and public understanding of energy and its interaction with the economy and the environment. "Massachusetts is the first state in the nation to combine energy and environmental agencies under one Cabinet secretary. In addition to the work we [the Office of Energy and Environmental Affairs] do every day to protect the environment, we are committed to making information available to the public in a user friendly and accessible manner. We encourage you to learn more about the various initiatives and programs that we are undertaking to preserve and enhance the quality of life in Massachusetts. You are welcome to read more about our recent announcements." The U.S. Global Change Research Program (USGCRP) was established by Presidential Initiative in 1989 and mandated by Congress in the Global Change Research Act (GCRA) of 1990 to develop and coordinate “a comprehensive and integrated United States research program which will assist the Nation and the world to understand, assess, predict, and respond to human-induced and natural processes of global change.” The National Climate Assessment summarizes the impacts of climate change on the United States, now and in the future. A team of more than 300 experts guided by a 60-member Federal Advisory Committee produced the report, which was extensively reviewed by the public and experts, including federal agencies and a panel of the National Academy of Sciences. "Reality — about 97% of climate experts have concluded that human-caused climate change is happening. Risk — that the reality of climate change means that there are climate change impacts we can expect, but we also must consider what might happen, especially the small, but real, chance that we may face abrupt changes with massively disruptive impacts. Response — that there is much we can do and that the sooner we respond, the better off we will be."